In 2016, audiences thrilled at the sight of a dozen Marvel superheroes battling it out in Captain America: Civil War, just a few weeks after the Man of Steel and the Dark Knight came to blows in Batman v Superman: Dawn of Justice. If it seems like there's nowhere comic book movies can go to top themselves, au contraire! Not only are the Justice League uniting the, uh, five (or six when Superman returns) in 2017, but next year the Avengers are poised to top themselves in their long-awaited showdown with Thanos in Infinity War that will reportedly also include Doctor Strange and potentially members of the Guardians of the Galaxy. The shared cinematic universe concept ushered in by Marvel Studios and now imitated by DC Films did away with the idea of each comic book movie featuring a lone superhero. Why, even Deadpool had fun with the idea of his existing within the FOX X-Men universe, with his fourth wall-breaking digs at both Wolverine and the actor who portrays him, Hugh Jackman. And yet, even with the embarrassment of riches comic book movie fans have already been gifted with, we always demand more! There are still a number of epic superhero slugfests we haven't seen on the silver screen. Comic book history is rife with superheroes resorting to violence over a misunderstanding, a perceived slight, a difference of opinion - or just hating each other. Wolverine's first appearance was, you guessed it, against the Incredible Hulk. Since then, the green goliath and the clawed Canadian mutant have tangled multiple times in the pages of Marvel Comics. 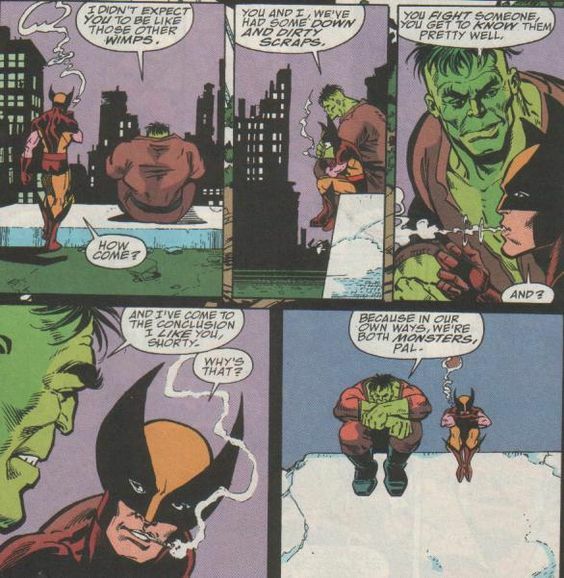 Even decidedly outsized by the Hulk, Logan's viciousness, with a big assist from his mutant healing factor, allowing him to survive the Hulk's overwhelming power, makes him one of the Hulk's most formidable opponents. And like many fighters who grow to respect their opponents, Hulk and Logan have expressed mutual admiration. But the heck with respect, we want to see Marvel's two toughest scrappers tear each other to shreds! Logan is reportedly Hugh Jackman's swan song playing Wolverine, but surely if the chance to pit his adamantium claws against Mark Ruffalo's Hulk came up, Jackman would be intrigued. The Hulk vs. Iron Man in Hulkbuster Armor fight was the centerpiece of Avengers: Age of Ultron, but a battle between Wolverine and the Hulk would top that for Marvel fans. Face it, bub. This would be the ultimate Marvel movie fight. Spider-Man and the Human Torch have known each other, and have been going at it, almost their entire superheroic lives. Spidey first tangled with the Torch all the way back in "Amazing Spider-Man" #1 when he visited the Baxter Building hoping to earn a spot in the Fantastic Four (and the paycheck he assumed came it). In those early 1960's stories, Johnny Storm even was a guest speaker at Peter Parker's alma mater Midtown High, and the two young superheroes would cross paths multiple times as denizens of New York City. While Spidey and the Torch often get along, usually they end up fighting. Spider-Man's incessant banter easily gets under Johnny Storm's skin, and it typically isn't long before the Torch Flames On and starts hurling fireballs at the web head. While it would take an unprecedented cooperation between FOX and Marvel Studios to see this classic Marvel match up in a movie, assuming FOX retains the actors from their ill-fated 2015 Fantastic Four reboot, who wouldn't love to munch popcorn and watch Tom Holland's wisecracking young Spider-Man annoy the heck out of Michael B. Jordan's brash Johnny Storm? This rivalry can be summed up in two words: "One punch!" See, back in the late 1980's, the Justice League was Justice League International, and the Green Lantern of that League was the obnoxious Guy Gardner. Batman attempted to lead the JLI in its early days and usually found a loudmouthed, insolent opponent in Gardner, who believed he was more qualified to be giving orders. It finally all came to a head in "Justice League" #5 (1987), a legendary fight that began and ended with... One. Punch. This is a moment just begging to be depicted in a future DC Film. DC Entertainment President Geoff Johns announced that the entire Green Lantern Corps will be depicted in the upcoming feature film, so that has to include Guy Gardner. One can only hope that in the coming years, Gardner will indeed run afowl of Ben Affleck's Batman, and we can finally see that One Punch. Maybe Ben is already balling a fist in preparation for a crowd-pleasing superhero movie moment. Of course, Cyclops' two beautiful telepath lovers have butted heads many times in the comics over who truly is the one who loves Scott Summers best. X-Men comics fans can argue who who they prefer to be with Cyclops, but in FOX's X-Men movies, Jean Grey and Emma Frost have yet to cross paths, much less argue over ol' Slim Summers like a mutant Betty and Veronica. In X-Men movie continuity, that's more or less canon (sorry not sorry "Emma Frost" in X-Men Origins: Wolverine), Emma Frost (portrayed by January Jones) was around in the 1960s and died some time in the 1970's, according to Days of Future Past. Jean Grey (currently played by Game of Thrones' Sophie Turner) was last seen as a teenager in the 1980's. The X-Men movies have always been more concerned with Wolverine and Cyclops fighting over Grey, but the X-Men movie universe is known to wantonly mess with its own timeline, so maybe we'll see Jean Grey and Emma Frost in a movie meeting of the minds someday. Sometimes Prince Namor the Sub-Mariner wants to destroy the surface world. Sometimes he fights to save it. Sometimes he's a villain. Sometimes he's a hero. And sometimes... he lusts after another man's wife. That man is Reed Richards, Mr. Fantastic of the Fantastic Four, and the lady in question is his wife Susan Storm, the Invisible Woman. Namor has spent years and years of Marvel comic book continuity shamelessly trying to cuckold Mr. Fantastic. Sometimes, Sue has even returned Namor's affections, despite being married and a mother of two. This has lead to many a super fight between Marvel's first mutant and the elastic genius. Movie audiences getting to see this crazy love triangle and the resulting fisticuffs between Sub-Mariner and Mr. Fantastic seems like an unlikely prospect. The Fantastic Four movie rights are retained by FOX and Marvel Chief Creative Officer Joe Quesada has indicated Namor's rights belong to Marvel Studios. Still, don't moviegoers deserve to some day see a muscular mutant in a Speedo and little ankle wings duke it out with a scientist made of rubber over the hand of an Invisible Woman? Yes. Could one feature film possibly contain this long-dreamed about Marvel movie match up? The X-Men is the franchise that launched our modern era of never-ending superhero movies. The Avengers took the comic book movie to new heights of creative possibilities, acclaim, and profitability. Yet they are owned by competing movie studios, so never can they meet and do cinematic battle. But what if they could and finally did? Imagine Jennifer Lawrence's Mystique against Scarlett Johansson's Black Widow. Imagine Ian McKellan's Magneto against Robert Downey, Jr.'s Iron Man. Imagine Chris Hemsworth's Thor against Alexandra Shipp's Storm, Sophie Turner's Jean Grey against Elizabeth Olsen's Scarlet Witch, or Evan Peters' Quicksilver against Aaron Taylor-Johnson's Quicksilver (wouldn't that be confusing for all kinds of reasons!). And of course, as previously discussed, Wolverine against the Hulk! As far as Marvel movie franchises coming together goes, Avengers vs. X-Men would be the holy grail. It could even follow the story of the blockbuster 2012 comic book series involving the two teams battling over control of the Phoenix Force. Box office records would surely fall if Earth's Mightiest Heroes and the Children of the Atom ever finally met on the silver screen. Currently a critically acclaimed and all-around X-cellent Marvel Comics crossover event, one wonders if the X-Men and the Inhumans can ever do battle in a movie. Various conspiracy theories in recent years have lobbed accusations that Marvel Comics has been de-emphasizing their beloved X-Men franchise in favor of the less popular Inhumans because FOX controls the X-Men movie rights instead of Marvel. Many X-Men fans continue to revolt against the very idea the Inhumans could ever supplant the beloved X-Men, whatever Marvel's publishing stratagems are. Complicating matters is that Inhumans has been demoted from a potential movie franchise to an upcoming ABC television series (debuting first on IMAX screens) later in 2017. (To the chagrin of Vin Diesel.) It seems X-tremely unlikely now that fans would ever get to thrill to Black Bolt taking on Wolverine, redhead Medusa grappling with redhead Jean Grey, or Karnak fighting Mystique on movie screens. This is fantasy warfare that seems purely relegated to the pages of the comics... for now. As we await seeing the Justice League united later in 2017, comic book fans in the know look upon Gal Gadot's Wonder Woman and Jason Momoa's Aquaman and see a match up that is just too juicy to ignore. In the pages of 2011's "Flashpoint" series (also adapted in the animated Justice League: The Flashpoint Paradox), Wonder Woman and Aquaman engaged in a sexual tryst that went... badly. The kind of badly that ignites a war between the Amazons and the Atlanteans that left much of Europe flooded. While it's far too early for the DC Cinematic Universe to move into that kind of storytelling ground with Aquaman and Wonder Woman, how amazing would a story that Game of Thrones-y be in a DC Film? One would speculate Gadot and Momoa would be up for the challenge. Both Wonder Woman and Aquaman are superhero royalty and two of the toughest fighters in the DC Universe. It would be quite a sight to see the Princess of Themyscria and the King of Atlantis do battle -- in land, sea, and air. Chalk this up to something requiring another highly unlikely movie studio cooperation, this time between Marvel Studios and DC Films, but this is an inter-comic book company superhero rivalry that goes back four decades. "The Battle of the Century" is how DC and Marvel Comics billed their first joint superhero crossover "Superman vs. The Amazing Spider-Man" (1976). In it, the Man of Steel and the Wall Crawler inexplicably lived in the same universe and took on a nefarious team up of Lex Luthor and Doctor Octopus. But first, they fought. And it didn't go that well for Spidey overall. A powerful antidote for what many fans found to be a grim, joyless fight between Batman and Superman in Batman v Superman would be a colorful match up between Superman and Spider-Man. It sure would be fun to see Tom Holland's Spidey both in awe of but also mildly irritating Henry Cavill's Superman in a super fight. 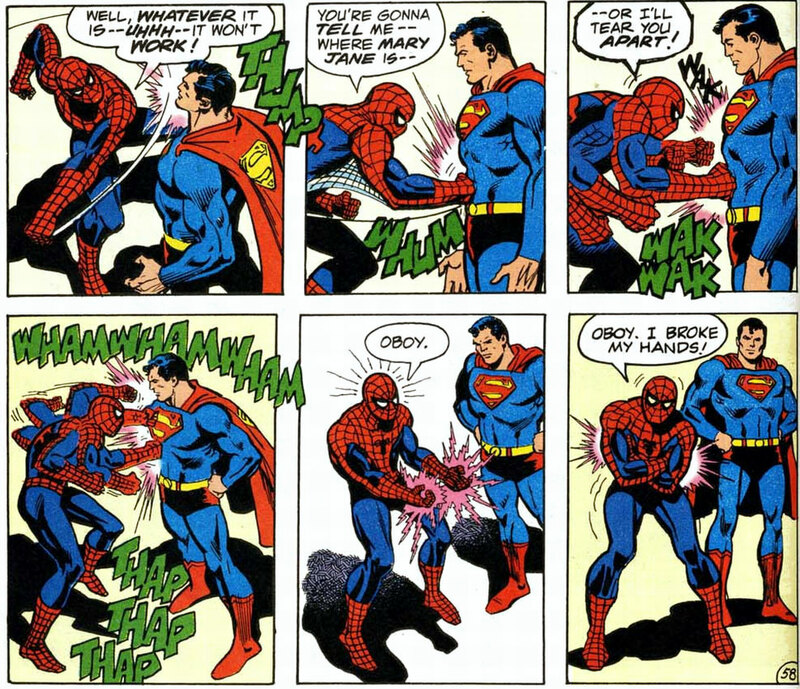 Why, Spidey might even get the Man of Steel to crack a smile, which would be a victory unto itself. Another blockbuster comic book event that's currently a huge hit, Justice League v Suicide Squad seems like a no-brainer for an eventual feature film from DC Films. After all, Batman v Superman grossed $873, 260, 194 and Suicide Squad grossed $745,600,054 respectively. Combined together, couldn't those franchises finally cross the elusive $1-billion mark coveted by DC Films? In the comics, the Squad and the League mostly do battle in issue #2, and the Squad admirably holds their own against the more powerful League. Though we've already seen Batman face off against both Deadshot and Harley Quinn and The Flash quickly (sorry) handle Captain Boomerang in Suicide Squad's flashbacks, a feature film conflagration between the two teams would be an opportunity to go completely balls to the wall. The chance to see Margot Robbie's Harley annoy Gal Gadot's proud Wonder Woman might be worth the price of admission by itself. For fans still questioning whether Justice League can successfully make the DC Cinematic Universe more joyful and fun, a scene where Henry Cavill's Man of Steel races Ezra Miller's Crimson Comet around the world just to see who's faster would be just what the doctor ordered. After all, there's gotta be room for a little fun and games in between battling the evils of Apokolips. The greatest challenge of a Superman v Flash cinematic race: outdoing the fun Supergirl and Grant Gustin's Flash had on television. They're Marvel Comics' top two superhero monsters. They've slugged it out, Gamma-powered rage vs. cosmic rays-derived rocky super strength, numerous times in the comics. Yet the Incredible Hulk and the ever-lovin' blue-eyed Thing have never crossed paths and torn everything around them asunder in a movie. The Emerald Archer has had it in for the Man of Steel in the comics for years. In Frank Miller's "The Dark Knight Returns," a one-armed Oliver Queen had Batman's back against Superman, firing off Kryptonite arrows at the big blue Boy Scout. (Some even speculate it was Superman who ripped off Green Arrow's arm.) More recently in "Injustice: Gods Among Us" Volume One, the evil fascist Superman outright murdered Green Arrow. So you can see why fans deserve to see Oliver Queen finally settle his hash with Clark Kent on movie screens, whether it's Charlie Hunnam or TV's Arrow Stephen Amell taking on Henry Cavill's Man of Steel. Now, odds are, even with a quiver full of Kryptonite arrows and a bag full of sneaky tricks, Green Arrow wouldn't come out on top against Superman. But isn't that never say die attitude why his fans love the Green Arrow? The Batman prides himself on being The World's Greatest Detective, and he is -- except for Sherlock Holmes, whom he's met in the comics. Why, the only man with the keen analytical mind and powers of deductive reasoning that bests even Batman's is Holmes himself. Perhaps it's time the two great detectives were pitted against each other on movie screens. Sherlock Holmes is a public domain character anyone can make a movie out of, but the two current versions of Sherlock Holmes most popular to audiences are Robert Downey, Jr.'s Sherlock Holmes and Benedict Cumberbatch's Sherlock. Both men are linked to Marvel Studios and play Avengers. But that's the beauty: the possibility of them crossing the aisle to portray Sherlock Holmes against Ben Affleck's Batman. Frankly, both men's loquacious self-centeredness would likely befuddle and bewilder Affleck's Dark Knight, but therein lies the game. Over a decade ago, Marvel and DC Comics combined to present JLA/Avengers (also known as Avengers/JLA), and years later later the two companies merged their two franchises into Amalgam Comics. Since then the Avengers have grown into the undisputed kings of comic book movies, while the Justice League desperately plays catch up. Could Stan Lee's famous phrase "Just imagine..." be more fittingly applied to a comic book movie? Henry Cavill's Superman taking on Robert Downey Jr.'s Iron Man. Ben Affleck's Batman battling Chris Evan's Captain America. Gal Gadot's Wonder Woman facing off against Chris Hemsworth's Thor. And that's just the big three marquee match ups that can be switched around. If this Marvel Studios and DC Films cross over comic book movie mega event ever happens, it might signal the end of comic book movies. After all, where would we go from here? But let the fanboy and fangirl within all of us dream of what would happen if the Avengers and the Justice League ever faced off in a feature film.